Discussion in 'BMX & Dirt Jumping' started by pancho64, Jan 10, 2008.
well i havent posted my bike up here in a while and i just got some new stuff so i figure no better time than now. going with only green, brown and white would make for an amazing looking ride, but i still like it, there are a lot of colors going on though. i love the sinister frames. yeah i thought of that. im trying to stay away from white tho and im sick of matching. as you can see im not sticking to a particular color scheme, just trying out a different look. the purple bars were the only ones brad had in stock. and they were "scratched" so i got them for cheap. the scratch is under the grip so you dont even see it. feels just like my old T1 now with these bars on. bend your saddle throwing mad trixorz? I like it and the dna is my all time favorite 2-sixxer frame eva! nice. im digging everything but the seat. 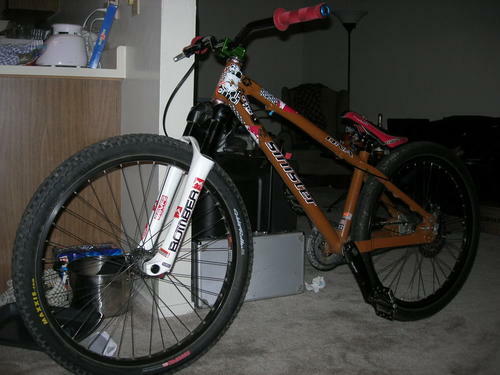 yeah thats the way i used to run it when i rode bmx. creature of habbit i guess. funny the frame and fork make the stem look tiny. and those bars are mad wide!! yeah the bars feel AMAZING. 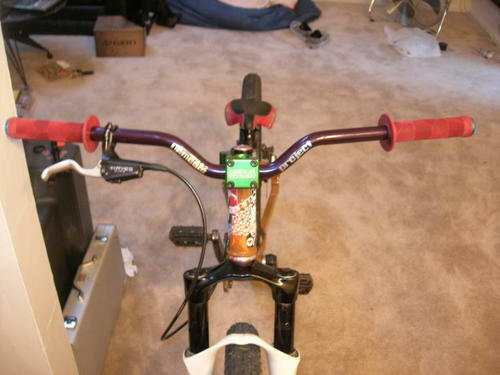 and if you think that stem looks tiny, i had a thomson x4 on there before which was smaller than that nempro one. but yes low slung and strong is how i like my bikes. i dont like to work on it unless im upgrading so i try to get stuff that doesnt break. word, i feel ya on setting and forgetting parts that you don't have to worry about. also, what rear tire is that and how do you like it? its the specialized street tire. its ok holds up very well to abuse. tracks and rolls decent. im only running this combo cuz i ruined my tioga fs100s by rolling through a bunch of thorns....now theres about 100 in each tire so i chucked em. i need another set. best street tires ever.